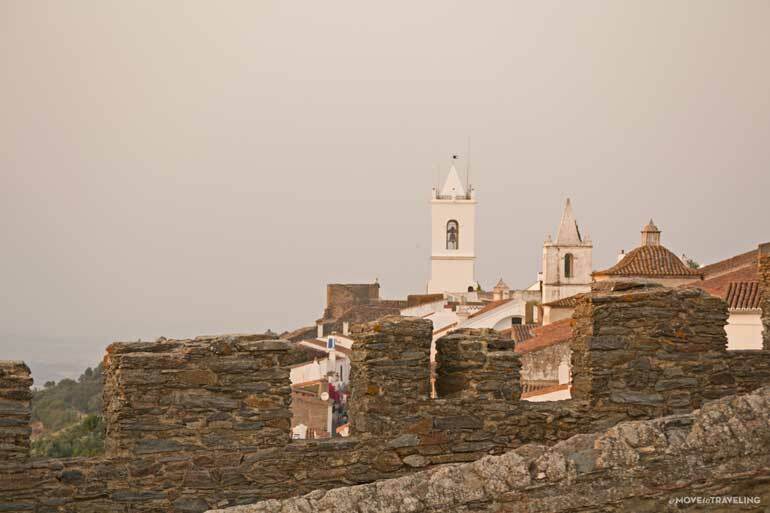 Standing in the center of the medieval village of Monsaraz, we could see why it is known as one of the most beautiful villages in Portugal. Here, it felt different than other medieval villages we’ve visited. The old stones forming the streets, and even the way they were placed together, were distinct. We had not known what to expect, yet were surprised most of all by how ancient it all looked. Or maybe it was a different kind of ancient. It felt more untouched by modern-day, aged by the passing of time yet still exuding medieval energy. 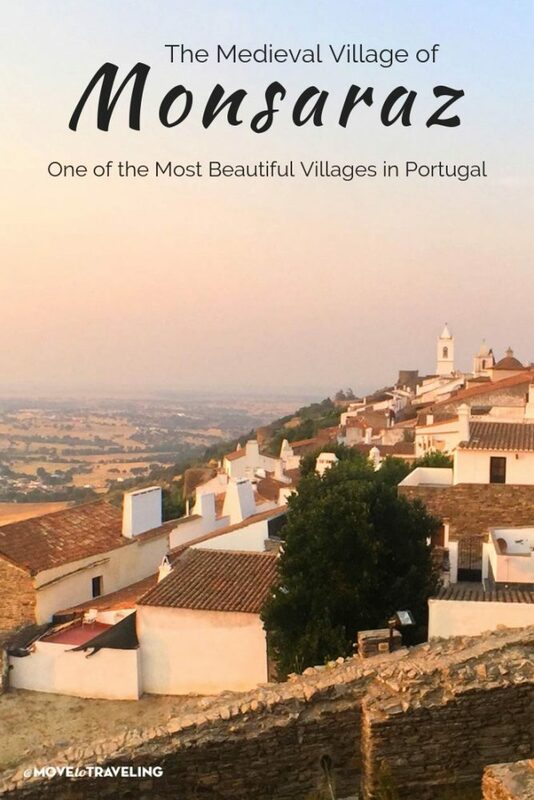 Learn from our visit to Monsaraz about what you can experience there and why it’s one of the most beautiful villages in Portugal. 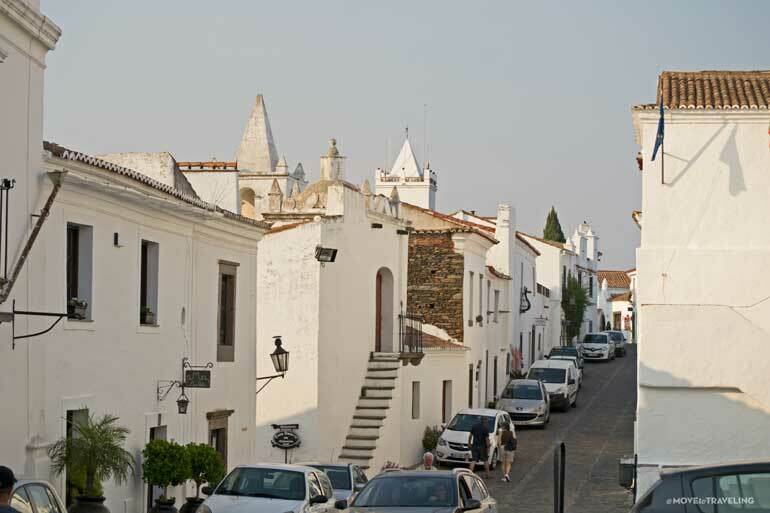 Arriving at Monsaraz is part of the thrill. It’s beautifully situated on the very top of the highest hill in the area. Getting there, means driving through open countryside that most of the way feels quite empty of civilization. There are fields of olive trees and livestock grazing, even right up the hillsides as you approach the town. The hilltop is a slender ridge that whitewashed traditional buildings seem to hug, nestled up close together and still surrounded today by the long-standing medieval wall. 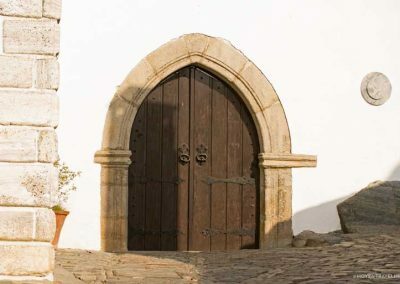 There are four entrances, or doors, into the village center on the top. 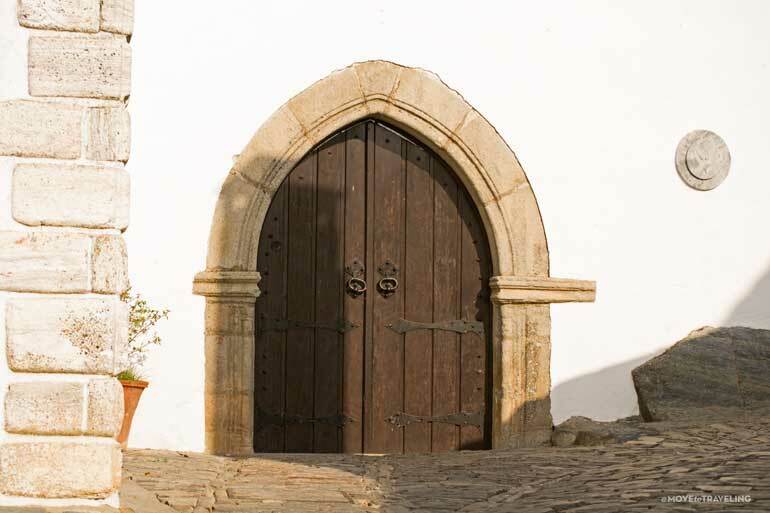 The main one is the ‘Porta de Vila’ (Village Door), which is made of a Gothic arch and two towers. On the north side is the Porta d’Evora, also with a Gothic arch and a turret. 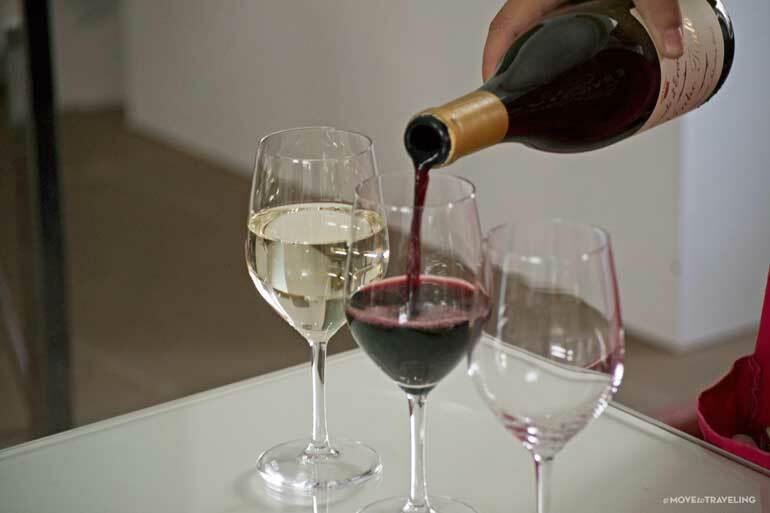 Then the other two are the d’Alcoba and Buraco, each made with a full arch. 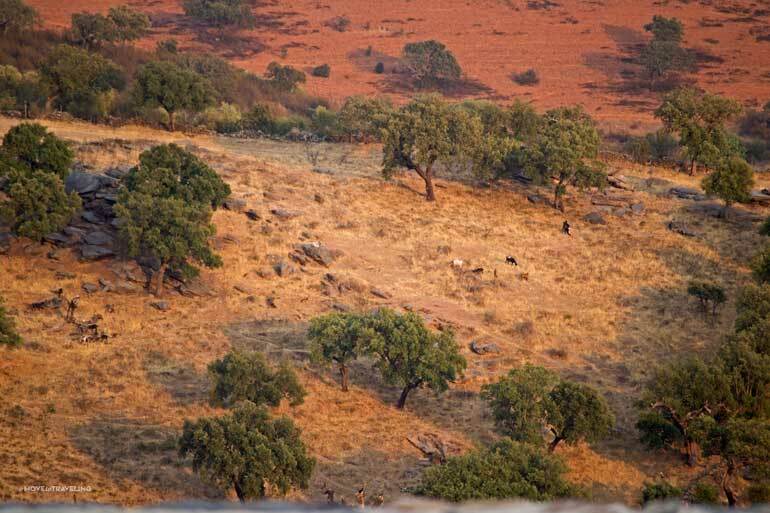 From any of these entrances, you can also enjoy magnificent views of the Alentejo fields below. You can park at the public parking areas outside the entrances and then enjoy the village as it is best experienced, on foot. During the day, there are no vehicles allowed inside the village center, adding to that back-in-time ambience even more. That is right. 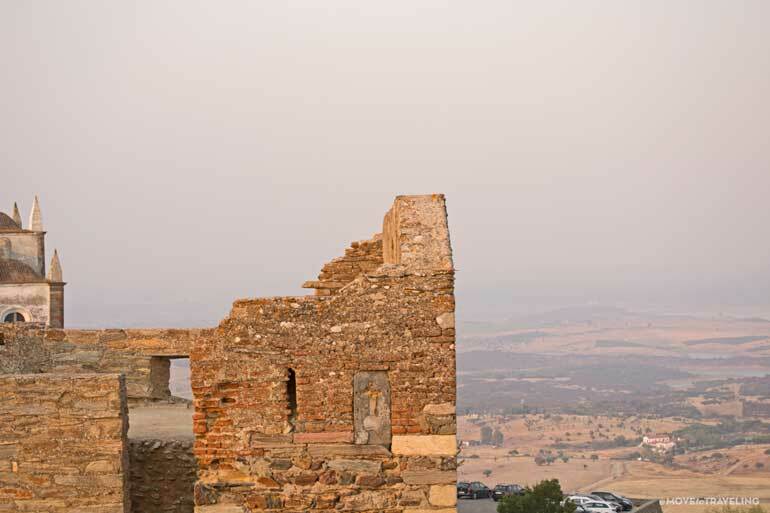 Monsaraz has a castle. 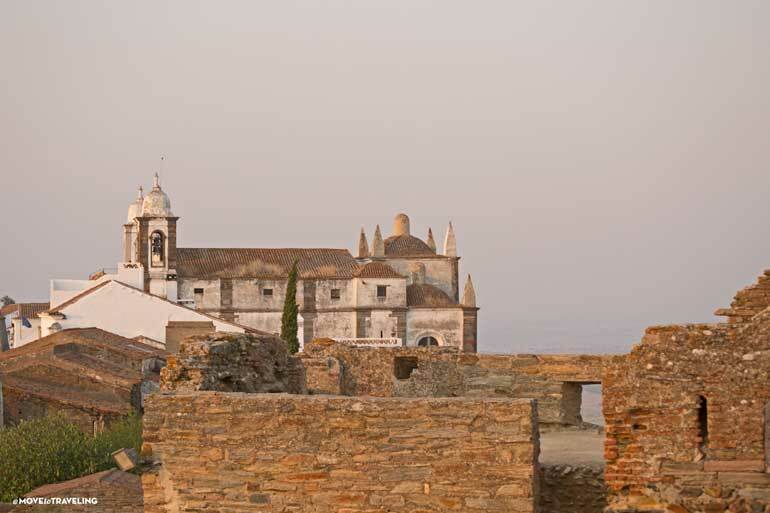 Located at one end of the village, it’s free to enter and is designated a National Monument of Portugal. 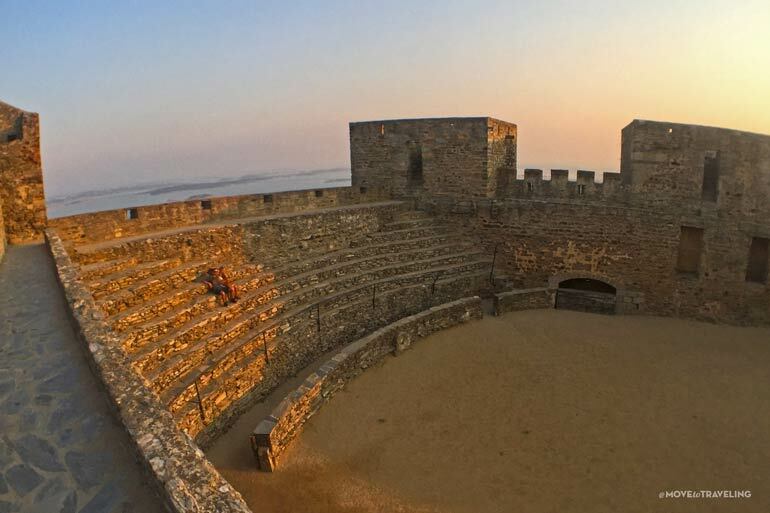 It was built by King Dinis in the 14th century and was used for defense purposes all the way up to around 1830. 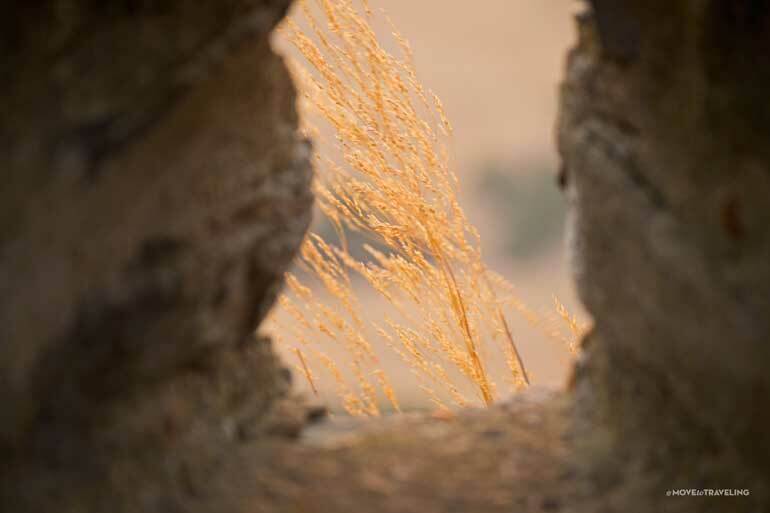 After all, the hilltop has been a strategic location, coveted throughout history. From its vantage point, you can see to the border with Spain and great distances in all other directions. 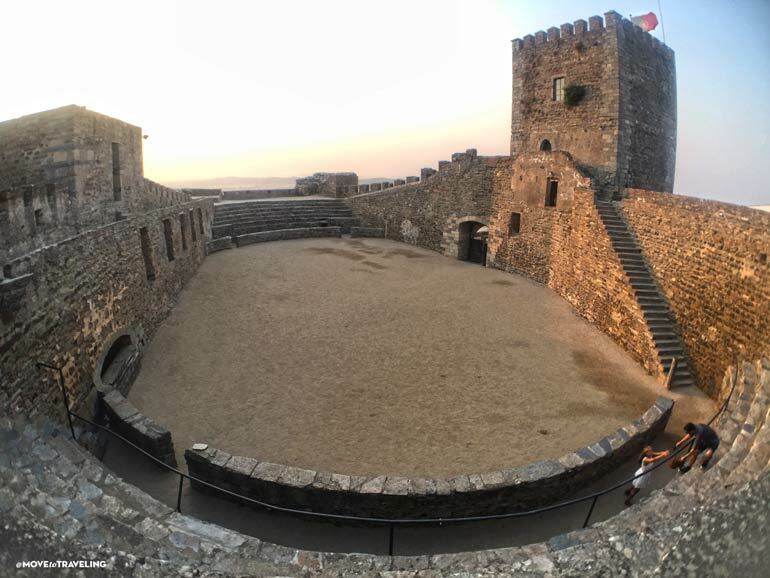 Some time later in the 1800’s, military use of the castle ceased and the grounds began to be used as a bullfighting ring. You can still walk the ring today and sit in its rows of terraced stone seats. Keep in mind when walking around, that there are very few hand rails along the stairways, towers, and upper ledges of stone. The stones can be precarious to walk on as well, so enjoy the adventure, but be careful of your step. 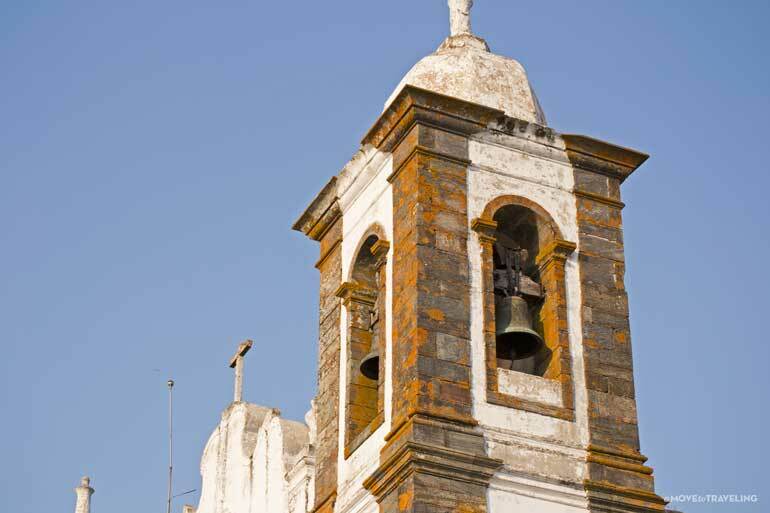 Monsaraz has had such diverse influences of civilizations throughout history. 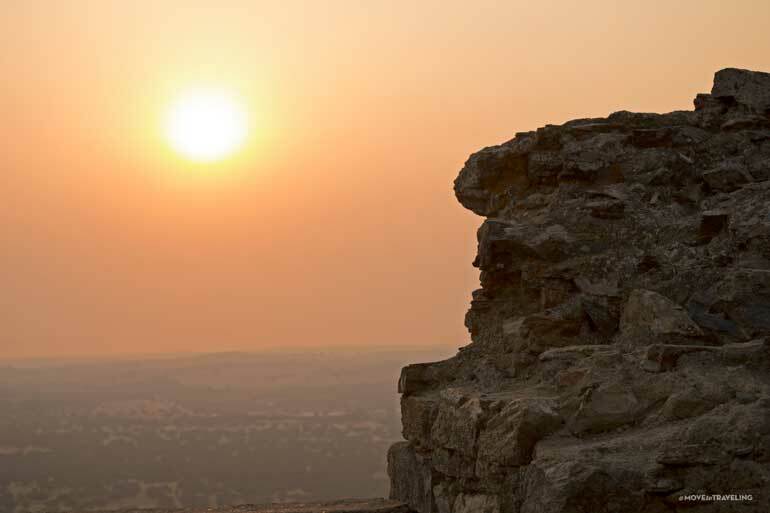 From the findings of the Megalithic structures in the area, it is known that it was inhabited since pre-historic times. Then in more recent history came the Romans, Visigoths, Jews, Moors, and Christians. 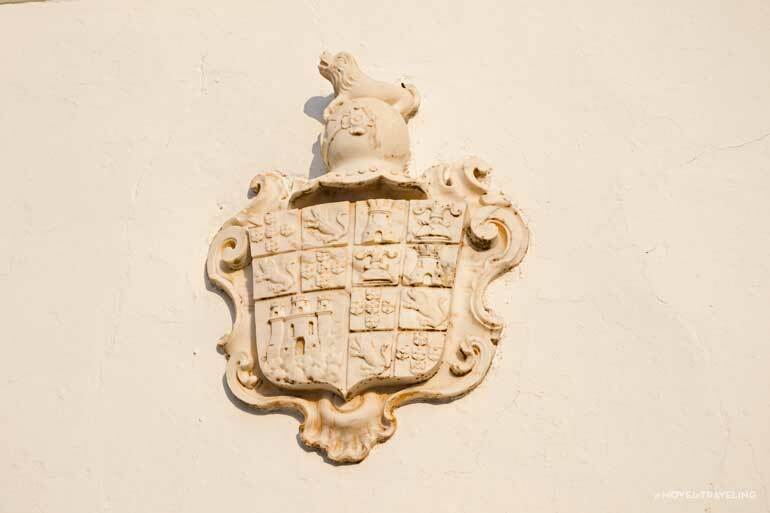 For centuries the struggle for power of this area was between the Arabs, Spanish, and Portuguese, who finally remained with it from the 13th century on. As mentioned before when talking about the castle, there was also the influence of the Knights Templar. 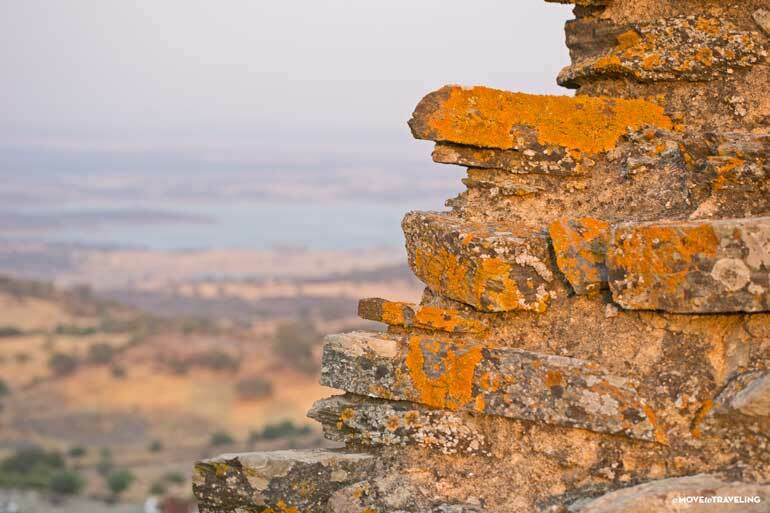 In 1232, they helped King Sancho II recover Monsaraz from the Moors. 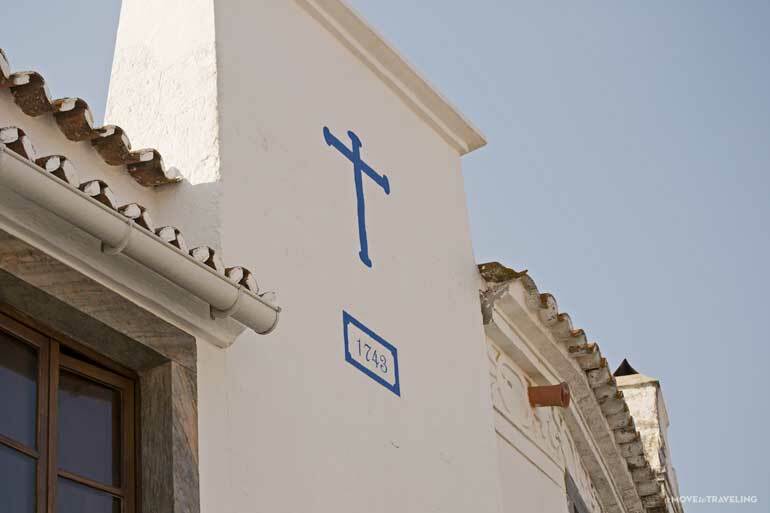 The village was then donated to the Knights Templar, which is why throughout the village, you can see marks of their influence that still remain. 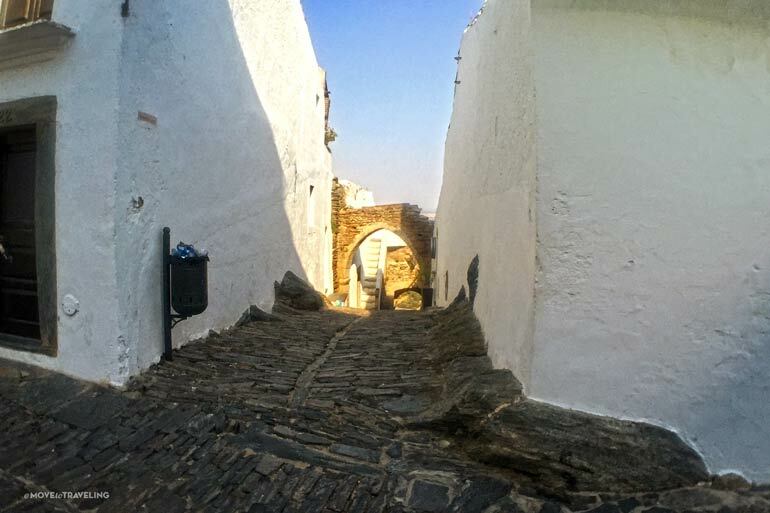 As simple as it is, we loved most of all walking the streets of Monsaraz. Everything is charmingly aged and made up of whitewashed walls, balconies and trellising flowers. What looks like someone’s home may turn out to be a local crafts store or restaurant with a scenic terrace. Even the rough rock walls, covered with bright shades of green lichen and earthy-red ocher (ochre according to the Brits), make the passing of time look like a beautifying effect on this place. The streets are made of countless rectangular stones and oval-shaped, smooth stones that are wedged together in varying lines. 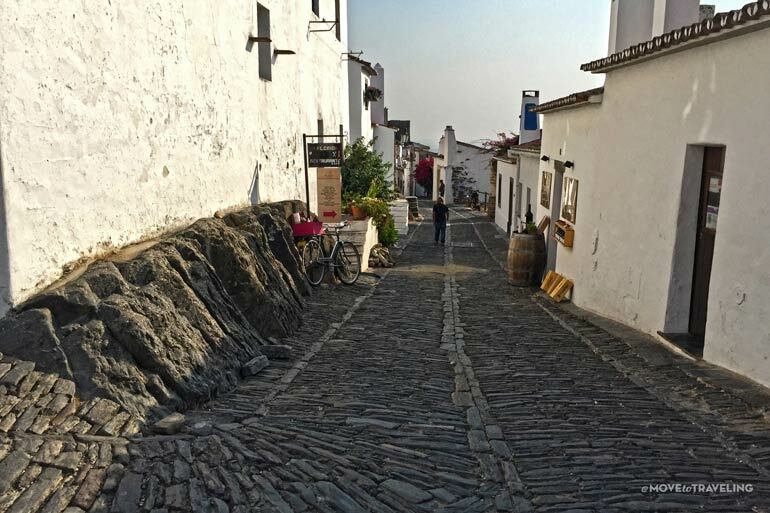 They aren’t the same as many traditional cobblestone streets, and we would say a bit tricker to walk on. Whatever you do, beware of wearing high heels ladies. One of our new friends who we met through Amalia’s mother, lives near Monsaraz and owns a fantastic boutique shop in the center, which we definitely made a visit to. Lola Creations by Francis and Toula is the best place to get beautiful gifts. From home decor, clothing, accessories and more, their shop is a colorful, cozy place to get lost in. 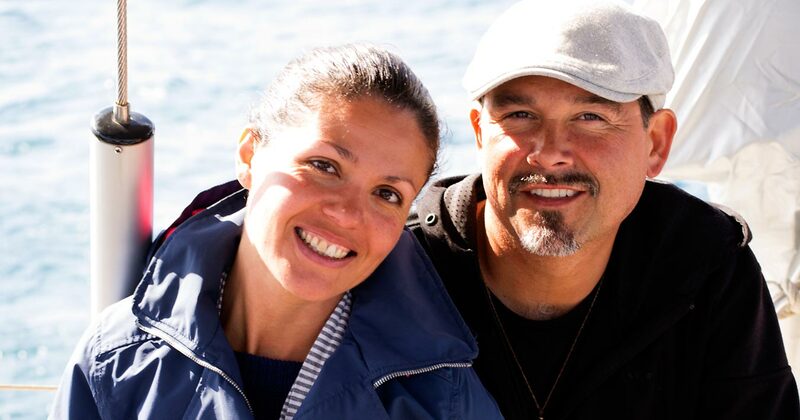 If you stop in, tell Toula and Francis that Amalia and Eric say hello! 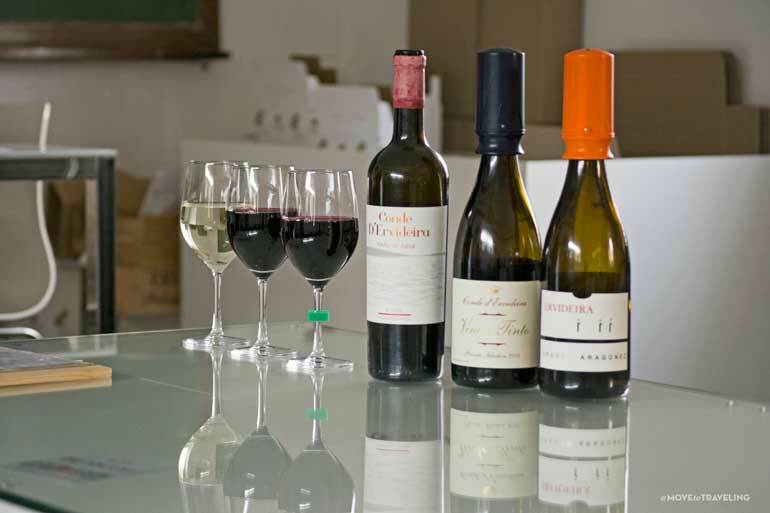 We especially enjoyed wine tasting at the charming Ervideira Wine Shop. They’re located right in the village and near the end towards the castle. 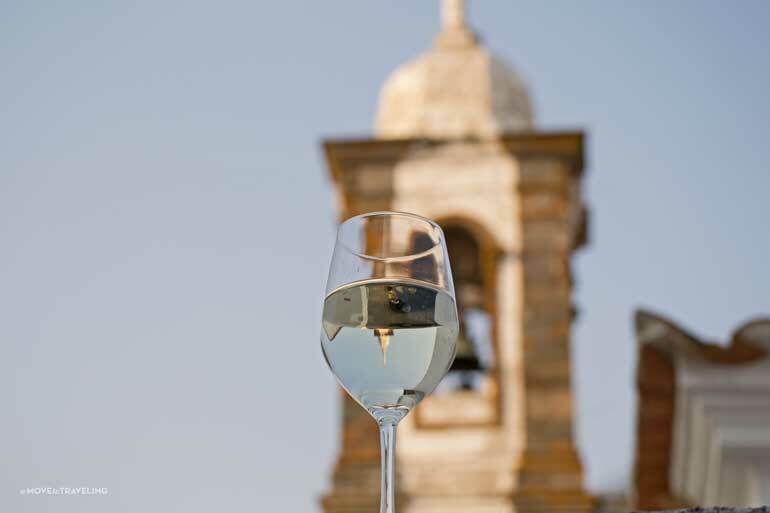 Sitting out on their rooftop terrace is a great way to sip on local wines and enjoy the gorgeous views. 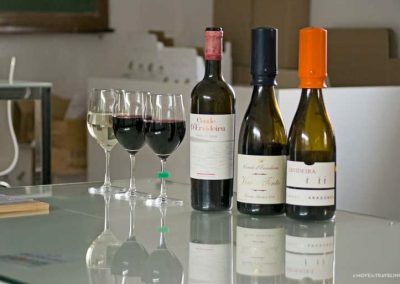 One of the unique local wines we tried was a wine that is clear and looks like water. It was quite good. In the center is the main square, Largo D. Nuno Álvares Pereira, and the church Igreja Matriz de Nossa Senhora da Lagoa. This beautiful architecture of Renaissance style, was built in the 16th century on the ruins of a gothic church that was destroyed because of the Black Plague. 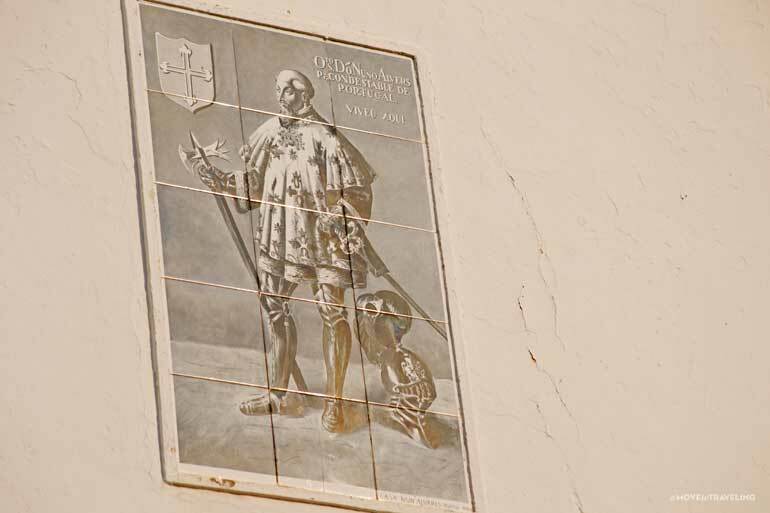 In the interior, you can see the tomb of a Knight Templar, Gomes Martins Silvestre, who was also the first mayor of Monsaraz. 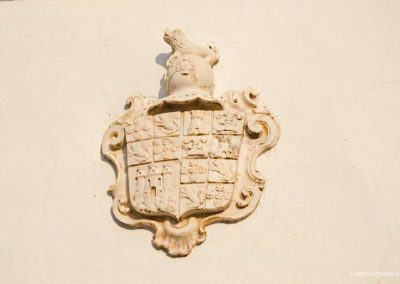 The Casa Monsaraz (House Monsaraz), a late 17th-century building that also displays the village coat of arms. The Hospital do Espírito Santo and Casa da Misericórdia, which also houses the small church of Igreja da Misericórdia. The old cistern, which they saw was originally a mosque a long time ago. The chapel of Capela de São João Batista, which is also known there as ‘Cuba’ because of its Moorish influence. The Ermidas de São Bento, São Lázaro, Santa Catarina, and São Sebastião; each shrines. Just within the surrounding area and countryside of Monsaraz, are the neolithic remains of megalithic monuments of Herdade de Xerez, Olival da Pega Dolmen (Anta), Bulhoa Menhir, Rocha dos Namorados Menhir and Outeiro Menhir. Enjoy spectacular views from the village of the Alqueva Dam, which is the largest man-made lake in Europe. Go star-gazing at night. 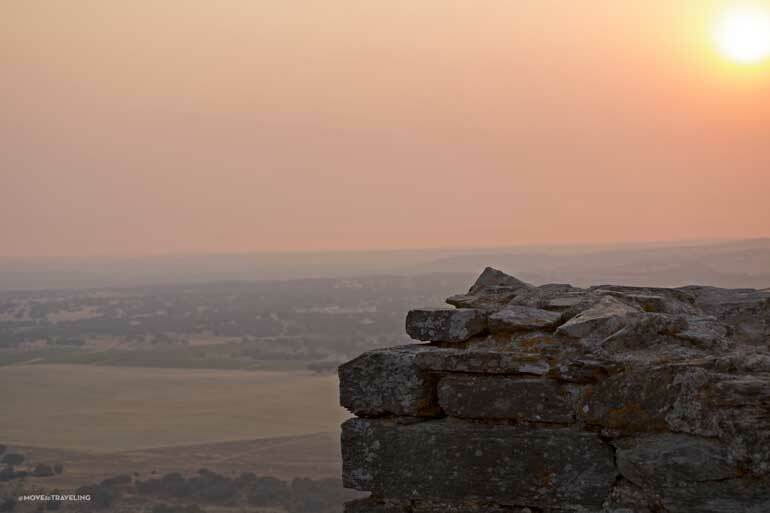 Monsaraz is actually known as a Starlight Tourism Destination, the first in the world. 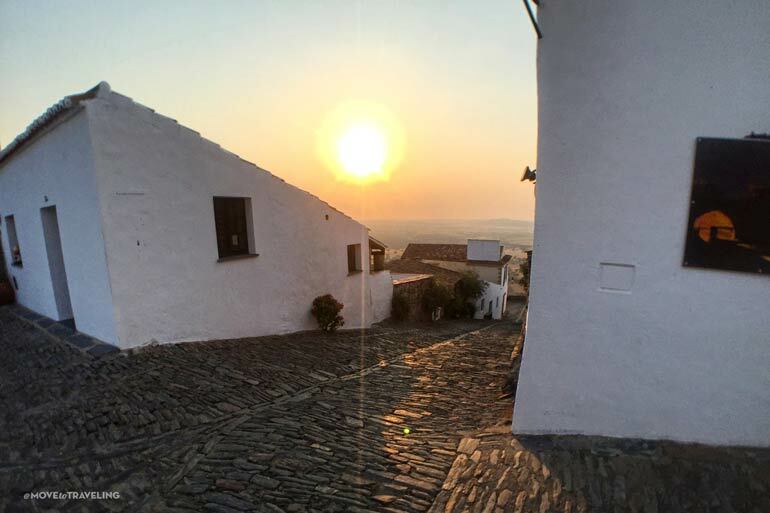 Because of the vast countryside around Monsaraz and no other city or town lights, the area is an amazing place to watch stars from. The village even turns their lights down at night so you can see them even more. 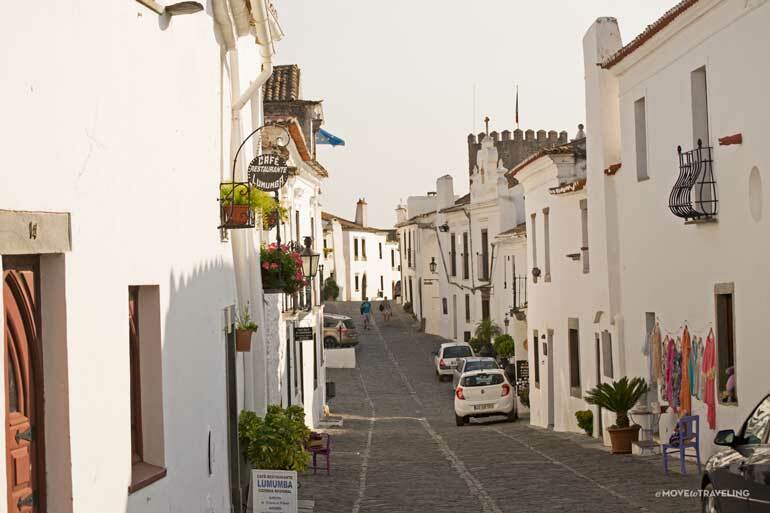 There are several small restaurants in the village center of Monsaraz. Many of them have beautiful terraces with spectacular views. The one that we ate dinner at is the Restaurant Xarez. Their steak was especially good and their wines. One of the traditional dishes that the area shares in common with neighboring Extremadura, is called Migas. This is an old peasant dish of breadcrumbs with seasonings and sometimes fresh diced veggies or chorizo. It’s essentially just like StoveTop stuffing from the US (remember that stuff? ), but way better! While we didn’t make it out to the surrounding area, we’ve heard that there are fantastic restaurants outside of the village as well. 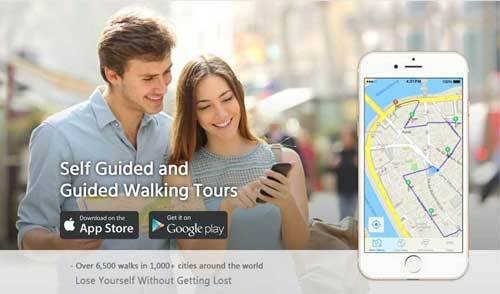 So be on the lookout and give time to tour the countryside as well. 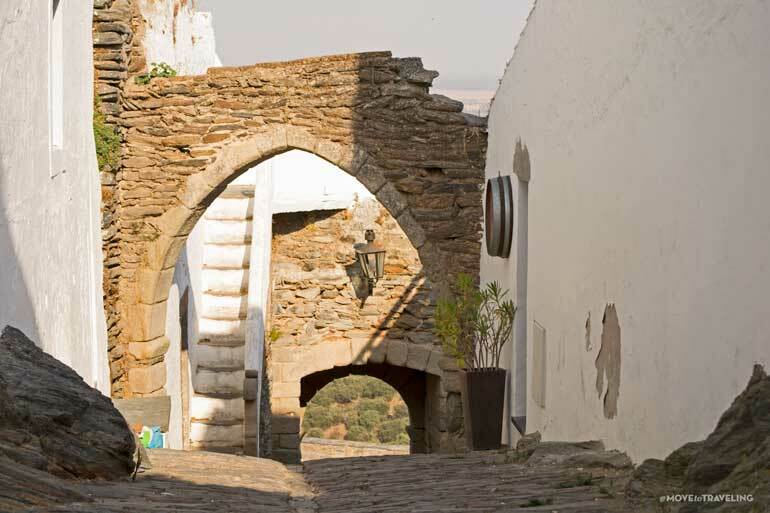 The area where Monsaraz is located is called Alqueva, the municipality is Reguengos de Monsaraz, and the region is called Alentejo. 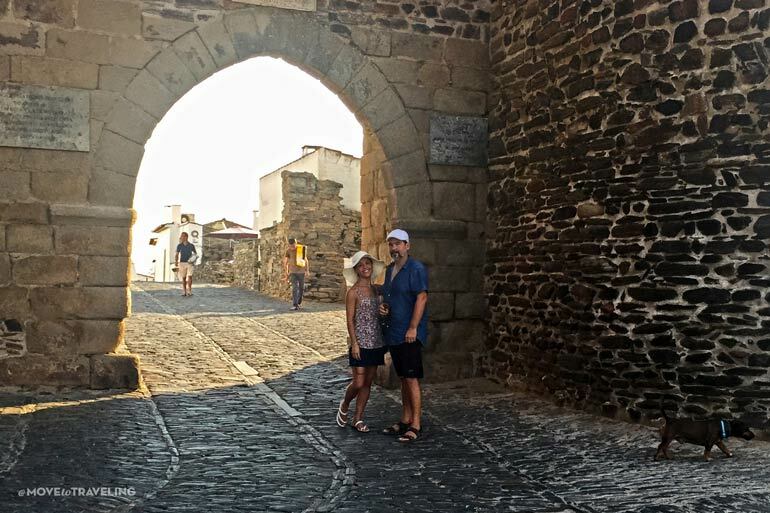 It’s only a couple of hours drive from the Portuguese border with Spain, particularly the southern part of the Spanish region of Extremadura. 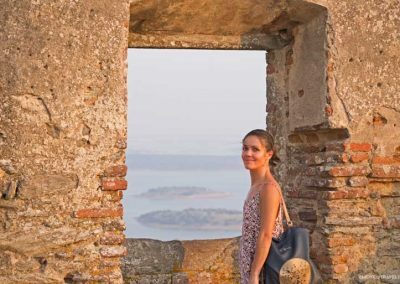 We visited Monsaraz by car with Amalia’s mother and partner who live in the tiny village of Higuera la Real in Extremadura, Spain. We’re unsure as to other modes of transportation besides car, but are pretty sure that there are no buses or trains that go there. So driving is the way to go. 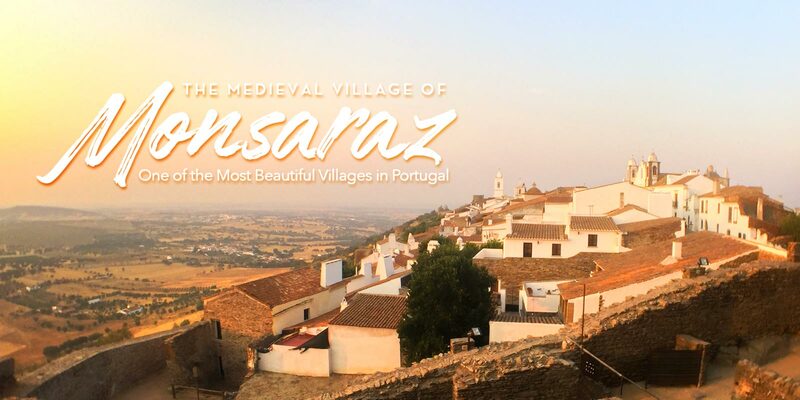 Our day-trip to the village of Monsaraz was wonderfully memorable. We certainly feel that although the village is small, one day was too short of a trip for experiencing it fully. So it is certainly on our list of places to return to for a stay of at least a few days or more. 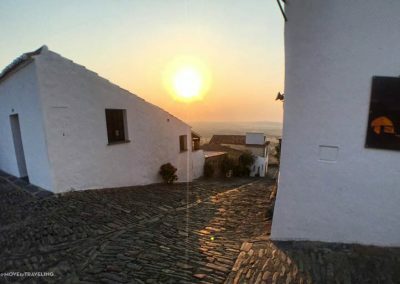 The village of Monsaraz and its surrounding area is an ideal place for enjoying ancient, medieval history and architecture, beautiful nature, and tranquility. We love how it is a little more difficult to get to, more remote, and thus less crowded and unspoiled. 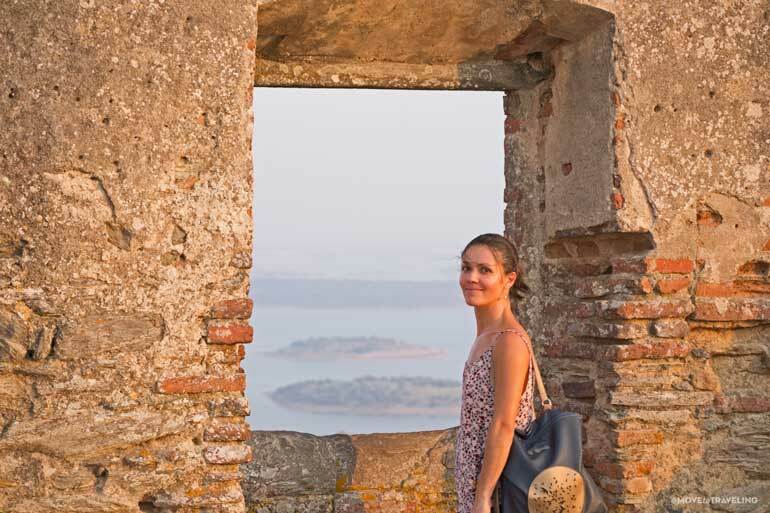 While much of the attention on Portugal is on its coastal villages and capital city, Monsaraz provides that place for discovering another side of Portugal, literally.